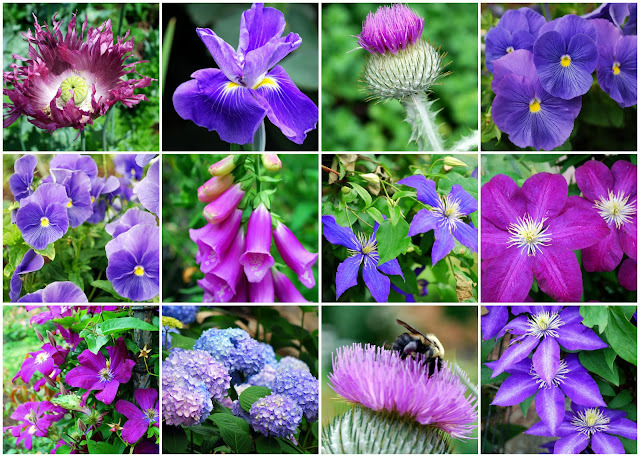 The Brooklyn Botanic Garden is a flower lover and photographer's delight! ....so my visit was enjoyable, despite the heat. Just look at this beautiful large tree! Of course I could not resist walking inside, where the cool shade was delightful! I sat for awhile and read a book I brought along to the garden, but of course I waited till Mr.Robin flew on his way! This is another rare tree in the garden. It is a "Weeping Hemlock" tree. The tree branches hang down instead of growing straight due to a mutation. I even saw a cherry tree full of fruit. The birds were enjoying this tree! The Japanese Hill Pond and Garden, located inside the Brooklyn Botanic Garden, is one of the oldest and most visited Japanese-inspired gardens outside Japan. It was also cool and quiet on the day I visited. If you missed my post about this beautiful area in spring, when the cherry trees are in blossom, click here to read it. The Japanese Hill Pond contains a gurgling waterfall, which is a wonderfully cool and calming sound to listen to while I strolled along this section of the garden. ...but I was amused to see this bird drying off his wings after he took a dip in the pond. It was a peaceful way to enjoy the afternoon, without the usual weekend crowds, and to cool off a little in a natural setting. 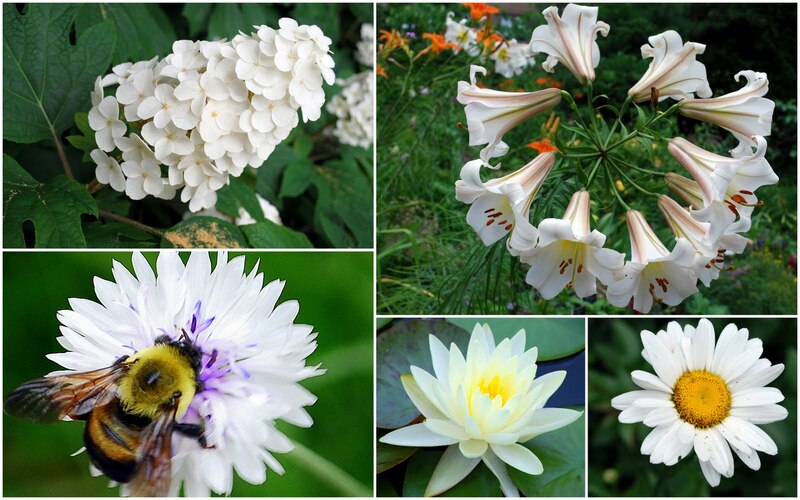 I took many more photos of flowers, of course, so I'll be sharing them along the way in the future! Stay cool and enjoy this last week of July! I'm linking this post to Beverly's "Pink Saturday" at her blog How Sweet The Sound, and to Susan's "Outdoor Wednesday" event on her blog A Southern Daydreamer. Please visit these wonderful blog and enjoy all the wonderful photos of the blogs participating in the events. My regular blog readers know that my husband and I are volunteers at the very beautiful, National Landmarked and historic Green-Wood Cemetery located on Fifth Avenue and 25th Street in Brooklyn, New York. We have worked on the Civil War Veteran Project at the cemetery for many years, which I have blogged about many times in the past, as well as other significant cemetery events, under this blog label. While the Civil War Veteran Project is still in progress, the Green-Wood Cemetery Historic Fund, in conjunction with the cemetery historian, Jeff Richman, and a Brooklyn College professor and college archivist, Anthony Cucchiara, have also involved the volunteers in a new project--preserving the cemetery's records of its over half million permanent residents. The cemetery's file cabinets are full of letters, photographs, books and blueprints dating back to the year it was founded in 1838. None of them have been archivally preserved or stored and as time progressed many of these documents were in danger of being lost to decay. As the volunteers work in the cemetery offices to preserve these files, we wear special cotton gloves to protect the documents from our finger oils. We carefully unfold these documents from their present storage in envelopes and place them in numerical order in archival sleeves. Photographs are placed in glassine archival envelopes. Those sleeves and envelopes are then placed in archival boxes which will now be stored in climate controlled archives room. 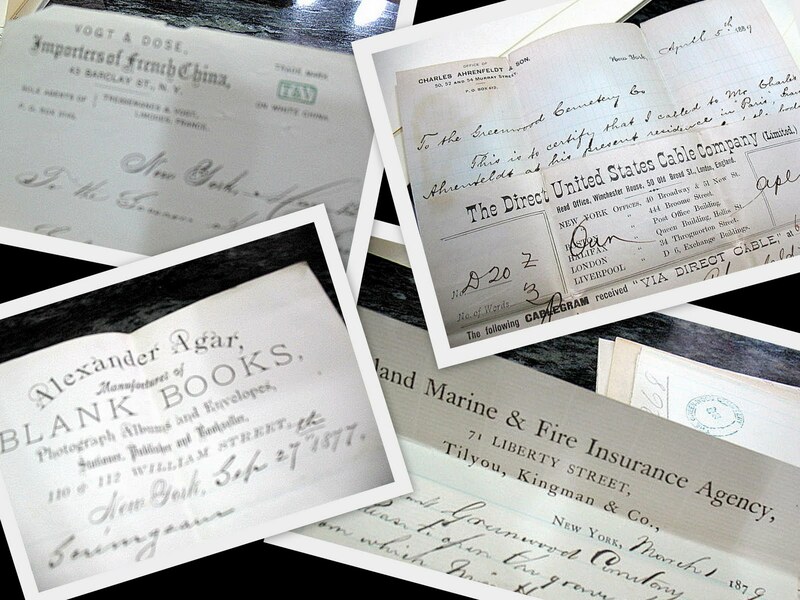 We are amazed and intrigued by the documents we are unfolding--19th century letterheads of undertakers, hotels and businesses, signatures of the famous, photographs of the cemetery and monuments, family trees, international and domestic telegraphs, burial programs and personal correspondences from the year 1838 until the present. We feel as if we have opened a time capsule of 172 years worth of lives that have left their marks upon this paper. It is a fascinating look into the past as these records are preserved for prosperity. Eventually, the Green-Wood Historic Fund will scan these records and make them available to family members, genealogists and researchers. It will take many hours of work to accomplish this task, but we feel honored to be a part of it. If anyone reading this post is in the New York City area and would like to help in the project you can contact the cemetery though their volunteer form at this link. Be a part of history! 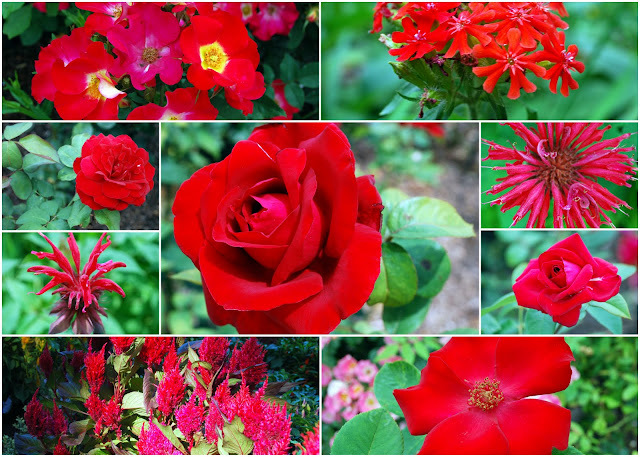 I'm linking to "Mosaic Monday" with Mary of The Little Red House blog, and My World Tuesday with Klaus and all the My World contributors. Please visit their blogs and enjoy their special blog events! In the shadow of the Brooklyn Bridge, along the waterfront of the East River, the once busy Brooklyn waterfront consisted of six piers and defunct bulk cargo shipping and storage complexes, built by the Port Authority of New York and New Jersey in the 1950s but rendered obsolete by the rise of container shipping in the 1980's. Left abandoned, the piers and buildings were an eyesore until neighborhood advocacy and government funding allowed the vision of turning this prime waterfront property into a park a reality for all to enjoy. Still under construction, the new Brooklyn Bridge Park is 85 acres of green space and recreational facilities, designed by landscape architecture firm Michael Van Valkenburgh Associates, and will soon span 1.3 miles of post-industrial waterfront between north of the Manhattan Bridge and Atlantic Avenue. This sign shows the areas of the park that has been completed colored in light blue, and the areas still under construction in the dark blue. A bicycle rentals stand in the park. The park encourages visitors "to stroll, bike, boat, learn and play amid the stunning views of the bridge, harbor and skyline." ...or by sitting on an expanse of lawn. ....or walk along a series of paths on the waterfront that has an ever changing view to enjoy. ...with the Statue of Liberty in the distance. 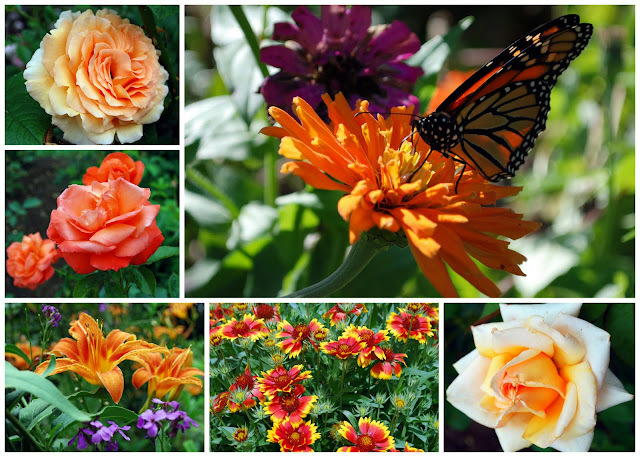 ....that are lined with trees and pocket gardens filled with native flowers and shrubs. 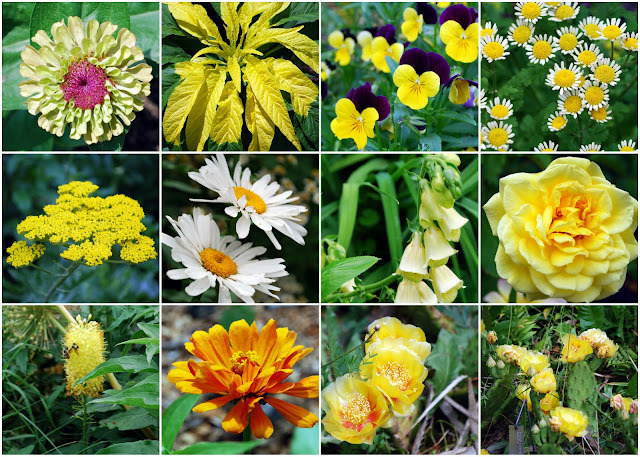 This collage shows some of the flowers I found along the park paths--Black eyed Susan daisies, wild pink roses, day lilies and even wild raspberries! There are two innovative children's playgrounds located in the park. This playground was smaller for young toddlers. There are even free "Movies With A View" nights being held in the park thsi summer! I had to include this photo of the eastern part of the park, as the building you see under construction in the background, with the cranes on top, is the new World Trade Center building. You can watch a video about the progress of the building and the 9-11 memorial waterfalls pools at this link. 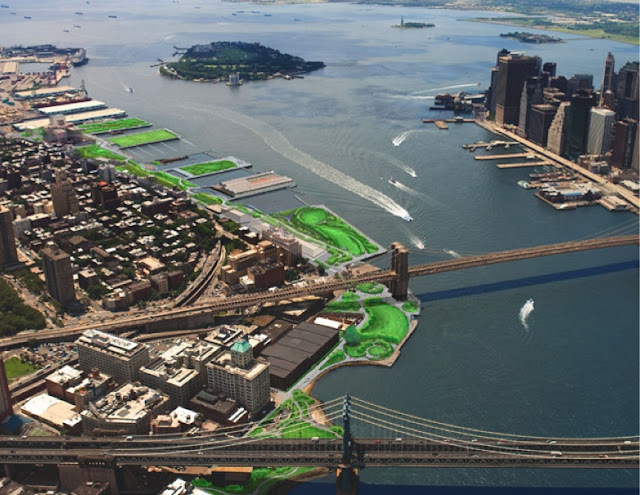 The Brooklyn Bridge Park is still under construction, and it is projected that approximately two-thirds of the park will be completed by 2013. It will tie in with the existing Empire--Fulton Ferry Park, which is undergoing improvements including a Jean Nouvel-designed pavilion to house a restored 1922 carousel, which you can see in the sign above. This aerial shot from the Buildipedia web site shows an artist interpretation of how the park will look when fully completed. It will include several floating pathways, boardwalks and beaches, fishing piers, and safe water for paddling in kayaks and canoes. There will also be 40 acres of recreational space including tennis, handball, basketball, and volleyball courts; playing fields for soccer, softball, and lacrosse; hockey and ice skating rinks; plenty of playgrounds; a bike path; and a year-round indoor recreational facility. You can see a diagram of how the entire park will look at this link, and you can read the park's blog at this link. 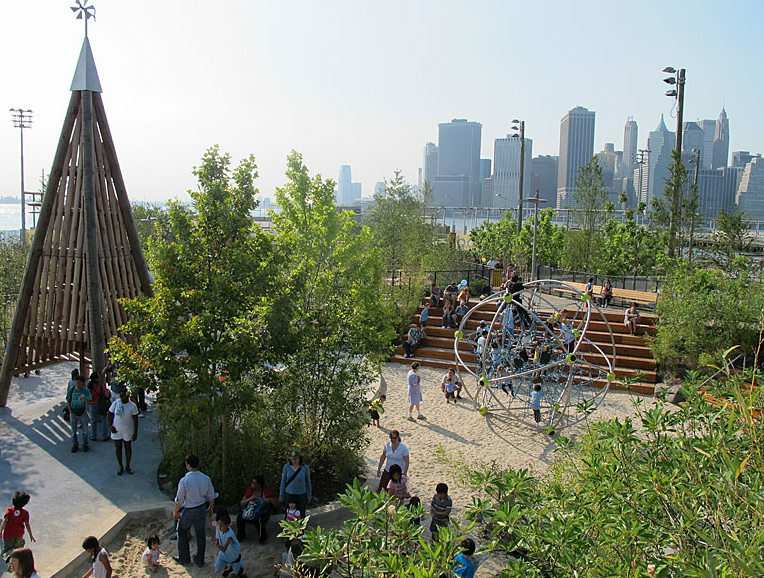 Brooklyn Bridge Park _ Michael Van Valkenburgh Associates from stephen knifton on Vimeo. You can watch the video above that shows some views of how this area looked before the park was built and also gives very interesting information about how the park was built using almost all reclaimed and recycled material. You can also watch the video on this web link. I hope that I've encouraged you to consider visiting the wonderful borough of Brooklyn in New York City. 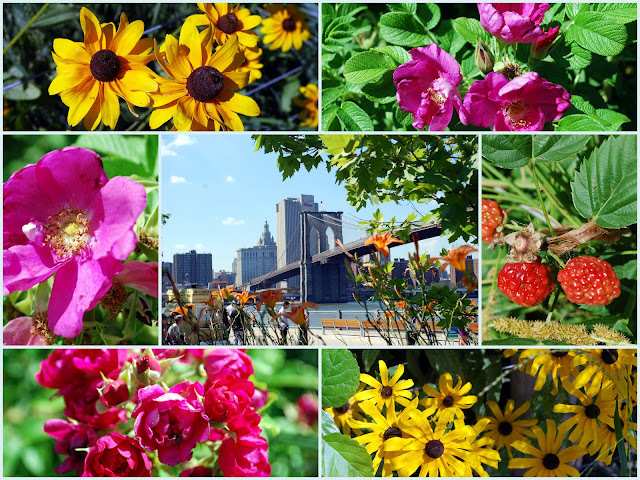 There's a lot to see in Brooklyn, and now another beautiful park to enjoy! 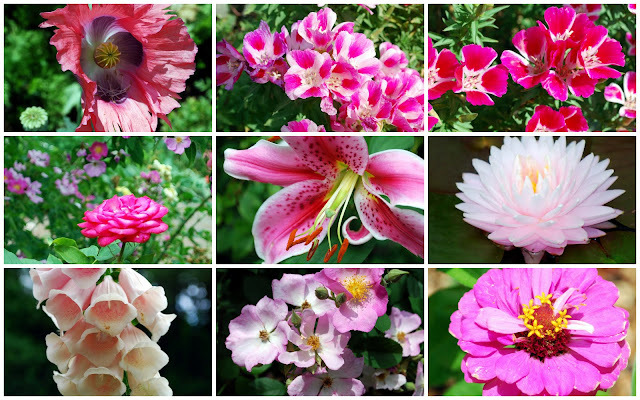 I'm linking to "Outdoor Wednesday" event on Susan's blog "A Southern Daydreamer," and for the first time, Watery Wednesday and "Pink Saturday" at Beverly's How Sweet The Sound blog. Please visit all these wonderful blogs and join in all the fun!